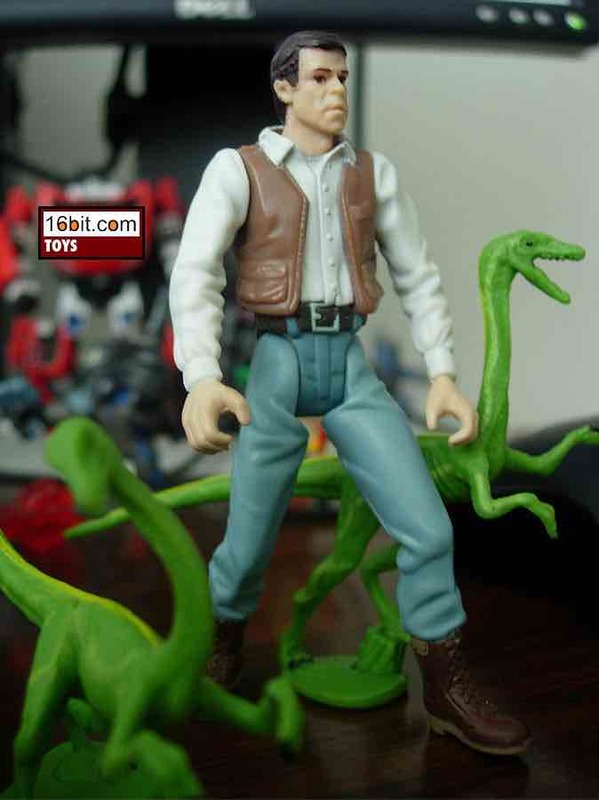 I bought this Dr. Alan Grant figure in the early 2000s for a buck at Wal-Mart, as the entire Jurassic Park III line seemed to be purchased for a swift closeout in my neck of the woods. "Old-fashioned" is the name of the game, especially if you consider this 3 3/4-inch figure came out after Hasbro popularized things like elbow joints on its Star Wars line. This figure-- heck, the whole line-- is a mix between the 1980s and 1990s house style of Kenner and the 3 3/4-inch empire that Hasbro would fashion a few years later. Dr. Grant's foot pegs are the same size as modern Star Wars, even if his 5 points of articulation are a step back from what was common in 1995. 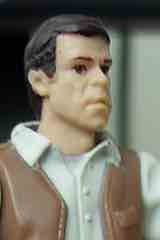 Part of the second wave of figures, this one had a thinner sculpt and a passing resemblance to Sam Neill. (D- is passing.) This came out after Hasbro really started to work hard on its human likenesses and whittle down on flash-in-the-pan movie licenses, but you wouldn't know it to look at it. Its action pose is straight-up 1990s Kenner, which means it may not look like much but it's built to take a beating. With swivel shoulders, hips, and neck, he won't fall apart on you-- but he can't hold his awkward rocket firing whatever-it-is either. It's an honest-to-goodness plaything, because no collector would look at this with a smile unless you've got the hots for old-school Kenner, and we at 16bit.com most certainly do. The figure comes with a pair of Compsognathus figures which have no articulation, but do sport the "JPIII" hip markings. Their spindly limbs may require some care to keep nice, so don't throw them in a box with your other toys. Being from 2001 on a fairly cheap line, they have limited deco and lackluster sculpting. Hasbro lavished all the paint and gimmicks on its larger toys. Don't let the "Hasbro" on the package fool you, these figures truly feel like the final line of the Kenner toy figure legacy.